The Constellation Hotel , 3-star hotel in Rimini, has been managed directly by the Rimini owners for over 30 years. It has parking, a small hydromassage pool, a garden, family services and free WI-FI-Fiber connection throughout the entire hotel. 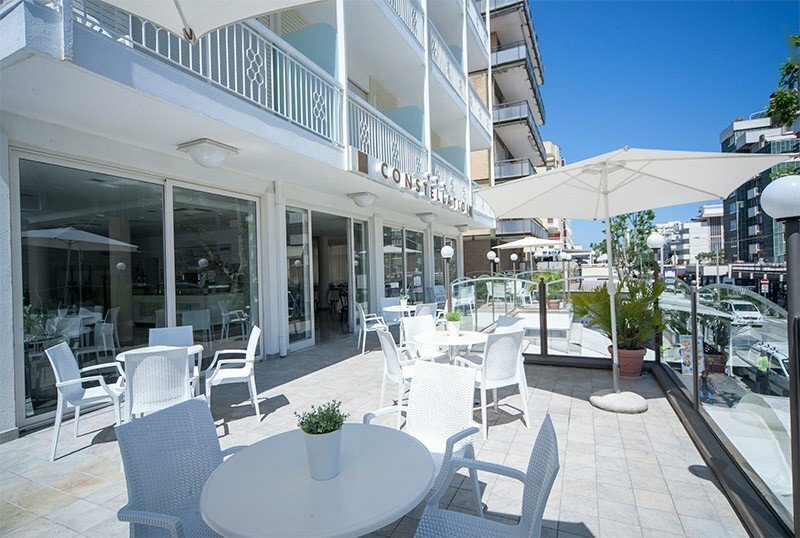 The hotel is located in Rimini, directly on the Viale Regina Elena walkway, in the central area, just a few meters from the beach. The hotel is conveniently served by public transport: bus n. 11 - stop n. 16. LUNA: standard double or twin room with French balcony on the mountain side, equipped with private bathroom with shower - some without box -, individually controlled air conditioning, WI-FI connection with fiber, satellite TV and digital terrestrial 22 ", electronic safe and phon. STELLA: wider room, with spacious front or side sea view balcony. It can accommodate more than 2 people thanks to the presence of a sofa bed or a bunk bed. It has all the services of the Luna room, to which is added the shower cubicle and the empty mini fridge available. VENUS: room furnished in a modern and comfortable way with bleached oak furniture and sliding glass door that overlooks a large balcony with panoramic sea view. In addition to the services of the Luna room, it has a spacious and modern bathroom particularly comfortable with a large shower cubicle and an empty mini fridge in the room. STELLA COMETA: new communicating room with 4 beds. Garden with small swimming pool with hydromassage (3 x 6 meters), large terrace directly overlooking Viale Regina Elena, bicycles available (also with child seats), bar area, air conditioned restaurant and lift. PARKING: uncovered and free, subject to availability. Garage on request, for a fee. WI-FI FIBER: available in the whole structure. PETS: only small dogs allowed (no cats). BREAKFAST: sweet and savory, buffet with the possibility of eating outdoors on the terrace restaurant facing the sea. It includes homemade desserts, hot drinks with fresh milk and instant coffee ground beans. LUNCH AND DINNER: the kitchen pays particular attention to the choice of raw materials, as well as respect for the Romagna gastronomic tradition. For lunch and dinner 2 different menus are offered (meat and fish) and a buffet of vegetables and appetizers. In the hotel: two strollers on request. Paid pediatrician. In the room: camping beds, bed rails. At meals: bottle warmers, table high chairs, colored glasses, preparation of baby food. On the beach: fenced playground area, entertainment. The structure has an agreement with the Bathroom n. 60 "Le Spiagge", with playground area, entertainment, fitness area, playgrounds, evening parties, dance lessons. Prices are per person per day in a double room based on the period. ALL INCLUSIVE: Full board with drinks at meals (water, house wine or soft drinks), air conditioning in the room, umbrella + 2 lounges per room. FULL BOARD: Full board with water at meals, air conditioning in the room. With our June offers in Rimini with free children, take your family on holiday at affordable prices. Children up to 6 years FREE until June 16th! Package for the holidays in July in Rimini! From 08 to 28 July, 7 days in Formula All Inclusive starting from € 60.00 per person per day. Our proposal to stay in Rimini in August is very advantageous. 7 nights from 27 July to 3 August, in the All Inclusive formula, starting from € 60.00 per person per day in the Luna Economy Room. Request information or a personalized quote. Special offer for couples in August. From 03 to 10 August, 7 nights in All Inclusive, starting from € 70.00 per person per night in the Luna Economy double room!